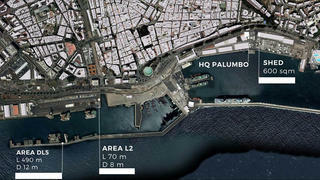 Monaco-based superyacht firm Palumbo Group has expanded its operations outside of the Mediterranean with the opening of a new refit yard in Tenerife. The Canary Islands facility includes two docks, measuring 490 metres and 70 metres respectively, as well as four telescopic cranes with a maximum lifting capacity of 300 tonnes. Other features of the new site include a 603 square metre warehouse and a 200 square metre office, while the nearest airport is within a 10 minute drive. Tenerife also benefits from preferential tax rates as a result of the Zona Especial Canaria that has been in place since 2001. Business operations in the Canary Islands are also not limited by EU competition requirements. In a statement, Palumbo Group added that its new base will be primarily focussing on the shipping and cruise ship sector, as superyacht charters in the area has not been heavily promoted so far. The Palumbo Group is best known in the superyacht industry for producing the Columbus range and also has bases in Naples, Messina, Malta and Marseilles.